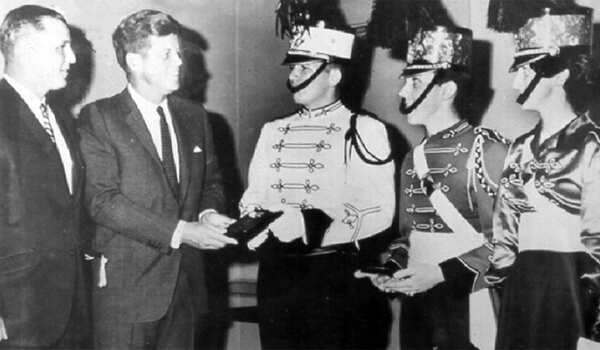 Drum majors of the Boston Crusaders make President John F. Kennedy an honorary member of their corps in 1963. For many, November 22, 1963 was the day America lost its innocence. On that Friday, United States President John F. Kennedy was assassinated while riding in a motorcade on the streets of Dallas, Texas. The tragedy gripped the country in a level of shock and mourning that wasn't witnessed again until decades later on that horrible September day when for the price of a few airline tickets, terrorists bought themselves humongous incendiary bombs with wings. In 1963 I was a third grader in a suburban Chicago elementary school. Early that afternoon the school's secretary took to the intercom system to announce the news that President Kennedy had been shot. There was shock in the classroom as the students tried to figure out the magnitude of what that meant and my teacher attempted to instantly change her lesson plan from whatever we were studying to a civics lesson. Less than 10 minutes later, the secretary came back on the PA system to announce that President Kennedy was dead. That moment is forever emblazoned on my memory, as I was sitting near the window of the classroom and turned my head to look through the wind and rain outside to see the soaked American flag attempting to flap in the wind. It's an image I still often see in my mind when I see the Stars and Stripes on similar days of inclement weather. Strangely, I remember nothing else from the rest of that school day except that the teacher Mrs. Juanita Wilder was crying. I remember finding my mother weeping during the Cuban Missile Crisis of October 1962, because she feared we might one day evaporate in a burst of radiation, or worse yet, not evaporate. But I couldn't wrap my head around the idea of what came to be known as MAD—Mutually Assured Destruction. I suspect that during that period, the television in our house was purposely tuned to something other than the news. The assassination of President Kennedy was something my classmates and I could wrap our heads around. We had often seen JFK on the news and we were taught about his role in the exploration of outer space. He was perhaps the first "Television President" in that he took office during an era when televisions became affordable for most families living on modest incomes. We all knew what he looked like and what he sounded like. His predecessor, Dwight D. Eisenhower, was but a footnote to us. Few of us knew much about him as President, nor could we appreciate his role as Supreme Commander of the Allied Forces in Europe during World War II. That war ended in 1945, further away from the date of our births than Kennedy's assassination. While the country was stunned by the sudden death of President Kennedy, the people of his home state of Massachusetts were devastated. Many of them had grown up with his face in their local news, from his exploits as a commander of PT torpedo boats in World War II, through his election to the U.S. House of Representatives in 1947 and his subsequent election as Senator from the state in 1953. Then, of course, they relished his election as President in 1960. Massachusetts' own drum corps, the Boston Crusaders, enjoyed a special relationship with President Kennedy. They achieved their access to the President via his brother Edward Kennedy, who in November of 1962 won a special election to serve the remainder of his brother's U.S. Senate seat. Corps director Joseph Dowling led the reorganization of the Hyde Park Crusaders to become the Boston Crusaders in 1959. Alum Jim Hughes says that the corps had 70 members at that time, and in an era of drum corps functioning as truly neighborhood organizations, 55 of those members were able to walk to rehearsals. It was Dowling who developed the relationship with Edward Kennedy, which led to the corps' relationship with the President. It was Edward Kennedy—not the President as is often cited—who intervened to aid the Crusaders by obtaining a number of old uniforms from the West Point Military Academy for the corps to use. Many will remember the Boston Crusaders paying tribute to those days during the summer of 2013 by wearing representations of those gray uniforms as part of their competitive production. According to Hughes, although the corps was invited to perform at Kennedy's inaugural parade in January of 1961, they didn't attend due to tight finances. They would have the opportunity, however, to participate in the inaugural parade for President Lyndon Baines Johnson four years later. The photo at the top of the article, courtesy of Hughes, shows the corps' drum major presenting President Kennedy with a plaque declaring him an honorary member of the corps. The photo was taken on October 19, 1963. Just 34 days later, Mrs. Benny turned on the intercom at Parkview Elementary School in Steger, Illinois to break the news no one wanted to hear.